With some of the best restaurants sporting Hedley & Bennett aprons and chef coats all over the world, the workwear brand makes yet another foray into the lifestyle arena with it's latest line of colorful and bright linens. 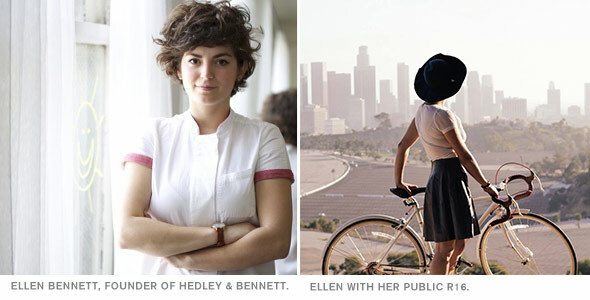 Taking inspiration from her recent trip to Cuba, Ellen Bennett, Founder & Creative Director of the culinary workwear brand Hedley & Bennett, created a colorful new line of napkins & table runners that echo the two main objectives of the brand: functionality and design. Known for throwing her colorful, fun Bennett Brunches, Bennett ran into a lack of bright, fun table linens she actually wanted to use. The solution? She designed her own. The colors & patterns were taken directly from the bright hues that peppered the streets of Havana on Bennett’s trip. Like the aprons & chef coats the company is known for, they’re as beautiful as they are practical. 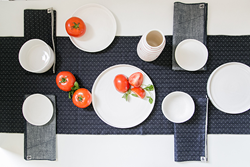 Made with various denims and cotton-linen blends, the napkins and table runners are meant to serve as the backdrop for your next Instagram-worthy brunch or dinner party. “It makes it so easy to incorporate color into anything!” Bennett proclaims. They come in five bold styles, meant to mix and match to create visually dynamic tablescapes for anyone who loves entertaining. “Table runners are usually sort of boring… you think of your mom’s house during the holidays, but we wanted to make something bright, friendly and full of life so your dishes can stand out even more” says Bennett. The Los Angeles-based company is making moves into creating housewares and other fun accessories for your kitchen while keeping it #madeinLA.